Happy Monday! 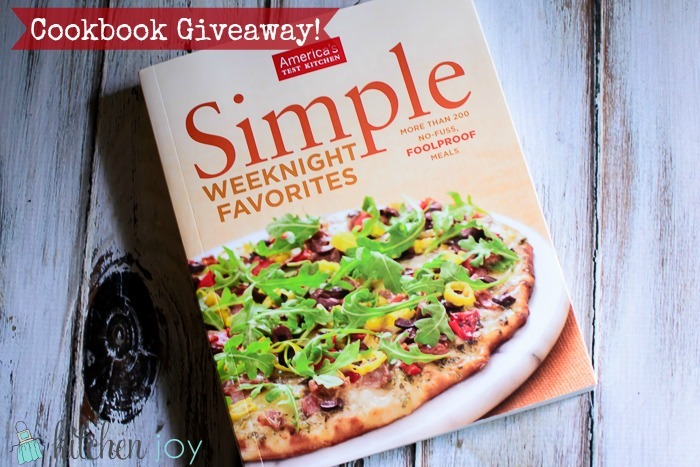 In celebration of our new found progress in the never-ending process that is obtaining work permits and visas for Italy, I’m giving away a copy of “Simple Weeknight Favorites: More than 200 No-Fuss, Foolproof Meals” by America’s Test Kitchen. As you are reading this, we are at what is hopefully our last interaction with the consulate prior to our impending departure to Italy. I’m trying not to get my hopes up too high, since every step of this process has gone as wrong as it possibly could have, but hopefully after today our luck will change. This cookbook has a great variety of weeknight meals that aren’t too fussy, but are still delicious and packed with wonderful fresh ingredients. There are sections on: Soups & Stews, Salads, Poultry, Beef, Pork, Seafood, Vegetarian Entrees, Grilling, Pasta & Risotto, Pizzas & Sandwiches, and Stir Fries, Curries & Asian Noodles. Weeknight meals don’t need to be boring anymore! 1. Click the Rafflecopter link below to enter. First, answering the question “If you could spend 3 months anywhere in the world, where would you go?” Please typs your answer in the comments section at the bottom of this page. This option is mandatory. Second, “Like” Kitchen Joy on Facebook. This is optional, but allows you an extra entry, so if you do both, you’ll double your chances to win! *** As with all of the giveaways on my site, this giveaway is sponsored by me. I purchased this book (one for me and one for you!) with my own finances, and am in no way affiliated or compensated by America’s Test Kitchen.